Hope that your car preparation work is nearly finished or at least the end is in site. Talking to a few entrants, many seem to be involved in a 'weldathon' as they attempt to build some strength back into our old cars! But on the other hand, many cars look to be ready and will undoubtedly grace our event. Been sometime since I last contacted you all. Rest assured we have been working hard on the event and are now on the finishing straight. The road book and stickers are about to go off for printing, and we are finalising all the last details. We will be holding the RBRR drivers Meeting at the British Motor Museum (New name for the old Heritage Museum), Banbury Road, Gaydon, Warwickshire CV35 0BJ just off the M40 between junctions 12 and 13, along the B4100. The meeting will start at 13.00hrs, however, please arrive early as we wish to give out all the Drivers Packs. With 150 no entrants this will take some time. The meeting will follow the usual script, including a small chat to us by the Guide Dog representative. We will discuss the route, car and person prep. etc etc. Note that we usually hold the meeting on a Sunday, for this year we thought the Saturday would be a better idea. If attending, please ask any questions relating to the event, if a new crew, do not worry about asking anything that you are unsure about. Remember we want all taking part to have a good time over the RBRR weekend. This year's RBRR has the largest amount of new crews taking part, approximately 33%. Please note that we cannot send out entry packs, so if you cannot make the Drivers Meeting to collect, collection can be made at the start at Knebworth. If you have not done so, please set up your Guide Dog just giving page, many have but there still seems to be a lot of entrants who have not. Alternatively, use a Guide Dogs pledge sheet, as attached pdf. Part of the reason for running this event is to raise money for the Charity. Fill in all other details. Once your JustGiving Page is completed, enter the below URL link into your web search browser and add yourself to the team. My colleague, Dave Langrick, has now rang all the new crews taking part, great to hear that all are entering into the spirit of the event and are well on the way to finalising the preparatory works to their cars. Please do not under estimate the length and durability of this event, prepare correctly! Entry administrator Jason Chinn is starting to receive changes from entrants. Please do let Jason know about any revisions to either car or crew as soon as they happen. Present entry is 148no. We have arranged with Knebworth to have a buffet available for all entrants upon their finish at the Barn. We need to let them know numbers of those who will stay and have some food, obviously we hope that all will, however some will want to get going home immediately upon their finish. Therefore, please let me know by return if you and your team require the free of charge food at the end. I can give you all 2 weeks from today to let me know, please let me know one way or the other, as I would hate for a team to go without grub at the finish. All teams that have requested food will have a team food ticket within their drivers packs. If I do not hear from you by the 01/09/16, I will assume that food is not required. Remember that the local Novotel at Stevenage which one will pass as you drive towards the Knebworth entry point has rooms that can be booked for Sunday night. That is about it for now, see you at Gaydon. I hope that any preparation work that has to be done to your car in time for the RBRR is coming along well. I understand that we have a few cars at present that are having some serious surgery applied, some seem to be in the middle of a full re-build! I hope that your Charity collecting is going well, looking at the Guide Dogs just giving page still has many an entrant to register and start a page, please do so asap. The biggest news is that we have changed the start venue from The Plough to Knebworth House near Stevenage, the same venue as the finish. Number of reasons for this change, the main ones being that traffic densities in the Crews Hill/Enfield area are too high now, especially the M25, and that The Plough has changed its status from being a pub into a gastro pub, therefore not that suitable for us. The full starting details will be released at the RBRR Drivers Meeting that is set for Saturday 24th September, at the newly named British Motor Museum, at Gaydon, Warwickshire. The start will still be at 18.00hrs, with the Signing In office being open from 14.00hrs on the 7th. Of course, the best advantage about using Knebworth is that it sits on the A1, thereby saving time and making it far easier to get going, we envisage that we should save at least 30 minutes of time. Nigel Abdullah is now working on the revisions to the Road Book and owing to the increased time at the start he will be building some more time for the Friday/Saturday morning Controls. Signing in and car parking at Knebworth will be in one of the Knebworth Barns that are hired out. Another massive advantage is that car parking is not as tight as The Plough, it has always been a devil of a job to park over 120no Triumph motor cars at Crews Hill, so to have extra space will be most appreciated, especially as at this time we have 150no cars taking part! Part of the deal that we have struck with Knebworth is that we must have at least 6 marshals for the car park area, we have 4 at present. If you know of anyone who would like to come and help, please ask them to contact me, details as below. Otherwise, nearly all the Controls are organised and we are about to start to sort the MSA Touring Assembly Permit with a view to having that done within the next 6 weeks. Andy Martin is busy designing the car stickers and a new polo shirt, this shirt to be sold by the CT shopkeeper Tina Lacey. We will contact all of you when this is available, these will be sold at the usual cheap price. Some really notable cars taking part, the oldest car to ever take part in the fifty years of the RBRR, the pre-war Vitesse of Dirk and Shaun. How about, 3no. World Cup Rally associated BL Works rally cars, a Dove TR4A, a Standard Super Ten, 3no. Stag saloons/estates, a TR7 Sprint, a 2.5Pi mk1 estate, 2no. mk2 2.5Pi estates and all types of Spitfire. Oh, and 2no. Triumph derived kit cars: Moss and Gentry. Without being sniffy, the Gentry will be the first car to take part wearing a MG badge, I have seen pics of this car and its bloomin’ lovely. Should be something to see all 150no cars at the start, blimey it will be a Triumph motor show! Right that is it for now, England are playing Portugal on the TV, so its time to sit down and watch it! Remember, any entry changes, please let Jason know asap. The Triumph and MG show at Stoneleigh is nearly upon us, set for a week on Sunday at The National Agricultural Centre. 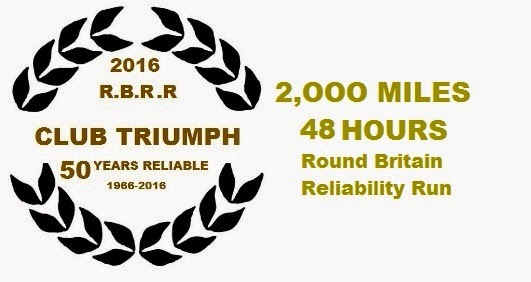 Club Triumph will have a stand at the show and we thought it would be good to have a RBRR entrants get together on the stand at 13.00hrs. The RBRR organisational team will be there, so it would be a good time for anyone taking part to come along and ask any questions that they may have. We look forward to seeing both new and old entrants at 13.00hrs. You may have read that we hope to organise some informal breakfast meets at various locations during the summer for all RBRR entrants to attend. We are still mulling over the locations of these meets, more news about where and when soon. A number of new entrants have asked to see a copy of the Road Book that we used last time, please see the attachment. The book is an evolution of the original book used in 1966. I have sent out info to all crews about how to set up the Just Giving page to enable them to get pledges for Guide Dogs. A few have asked for traditional paper forms, I will email these out soon. I will also have Guide Dog collection tins with me at Stoneleigh, so please ask me for one. Note: If you have used Just Giving for a previous charitable event or indeed the last the RBRR, the last few steps will not be necessary as you will have an account with Just Giving. This will lead to the template that can be used to create your page. When you have created your page, it is most important that you link it to the main page, this will ensure your collected money will be added to the RBRR grand total. Please use the following URL link https://www.justgiving.com/teams/RBRR2016 (This is the corrected address, as my email dated 02/02/16) and add your page to the team page. 1. You can amend your fundraising page whenever you like, adding pictures, words etc. Please try and make the page as personal as possible, there is some standard Just Giving script within the template, this can be used or adapted. Photos of the car and the team would be great, also why not include a brief history of the car? 2. We would prefer that all teams had just one page, however should you wish, have a page for each member of your team. 3. Prefix your page title with your entry no. 4. For this 2016 RBRR we are have set up a Team Page, in 2014 we had a Company Page, which it must be said was preferable. The Team page is free to set up and use, where as the Company page now costs £39.00 per month. As the Team page ultimately serves the same purpose, we went for the cheaper option. To attempt to get all crews to raise money for Guide Dogs we have decided to offer free entry to the 2018 RBRR to the top three crews who raise the largest amount this time. A bit of competition should focus the mind etc. We are really serious about the charitable aspect of the RBRR, for this year's event we want all crews to raise charity money, with such a large entry, £90K must be achievable. Please note that all emails that are sent out, will only be sent to the main entrant, unfortunately we have not got time to send to all other crew members. Most aspects of the RBRR are starting to come together now, we have an organisational meeting a week on Saturday and hope to finalise a lot of the plans that we have for the event. We are hopeful that we will have a few different stops for the event, no clues as yet, these will be revealed at the Drivers Meeting in September. I have mentioned this before, but we hope to have revised range of RBRR merchandise available soon. We still have some products left from 2014, including RBRR mugs, see Tina on the CT stand and I am sure she will be pleased to sell you some. Hope to see many of you at Stoneleigh.